TS DSE has released the official vidya volunteers notification through official website. DSE has finished of TS vv's online application process between 1st June 2017 to 5th June 2017. Now they are plan to release tentative merit list of vidya volunteers with mandal wise and district wise through http://183.82.107.60:8080/vvs2017/. If any objection on merit list, applicant send reasonable objection through given format to DSE.TS VVs Online Application Submission Process was also completed. A huge number of candidates applied for this posts.Now candidates are waiting for TS VVs merit list. The DEO shall place the merit list of the Candidates so prepared before the District Level Committee comprising - District Collector; Project Officer, ITDA/Addl. Joint Collector/Chief Executive Officer, ZP and District Educational Officer as the Member Secretary. The District Collector shall personally head this Committee and oversee the entire process of engaging these Vidya Volunteers. 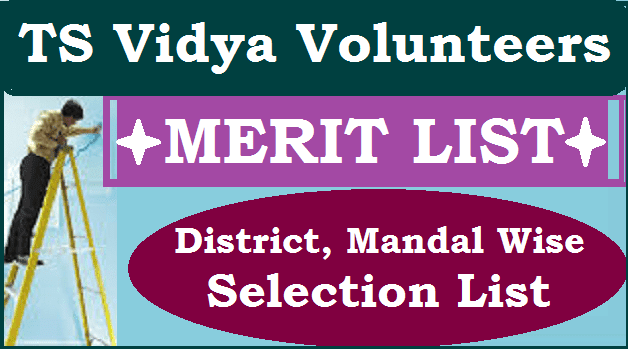 After finalisation of the lists of Vidya Volunteers by the District Level Committee, the same shall be communicated to the Mandal Educational Officers for onward communication to the School Management Committees for engaging the Vidya Volunteers in the school. Any grievance on the above order lies in Appeal to the Director of School Education within a week from the date of publication of the lists by the SMCs.